Do you want to participate in the European Way? We are happy to welcome you on the way towards a better place. You have endless opportunities to participate within The European Way. We work as an open and independent network operating on five fields of activity. We are focused on engaging the broad public and to create a uniting European discourse. Since our goal is to enable self-sustainable European Circles in major cities offering a platform for local activists, you can of course found your own European Way Cirlce. The first European Circles have been founded in Berlin, Bologna (find information about the Cirlce and their work here), Friedrichshafen, Heidelberg, Oldenburg and Vienna. The guidelines how to do this will be up soon! Maybe there’s already a Circle in your city? You can share your knowledge and inspire others with your ideas by contributing to our content section which you can find in the “Imagine”-Section of this page. 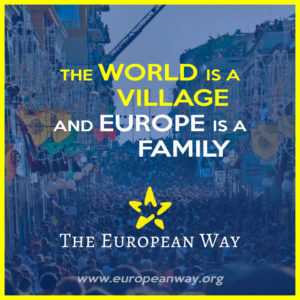 If you’re interested in TEW, get in touch with us via info@europeanway.org and we’ll come back to you as soon as possible. We will soon publish further position papers, videos, interviews, ecards, print materials and other articles. To overcome linguistic borders we aim to translate our work into as many languages as possible. Since the idea of nonviolence and the overcoming of borders embraces all fields of human activity and interest, every constructive voice is needed. You can be part of the network, if you want to contribute to the idea. We search for thinkers, dreamers, bloggers, translators, designers, artists, programmers and many more. In order to spread the message and constructive means of communication we foster the accessibility to information. It is necessary to raise awareness with all available means. Campaigning for the European identity means to address the walls standing in the way of nonviolent solutions. You can easily access the materials we have produced, as we offer them for free and invite you to use the material and to be part of the change. Political change for the better can happen, when civil society is enlightened and determined to succeed. The European Circles are dedicated to activities able to involve uninterested and disaffected people. Each Circle cooperates with local partners and develops individual approaches adaptive to the local environment, while the European Way network ensures coordinated action and the diffusion of ideas. Please contact us, if you want to know more on how to organize your local European Circle and stay tuned for more about the other Circles are growing. History is repeating itself. People are being dehumanized and harassed once more. We are in the middle of a vicious circle of egoism and fear. If we do not change the way we think and act today, violence will prevail and walls will kill the European vision of peace and respect. Don’t wait any longer for somebody else to fix this mess. Stand in for your values and fight for a free, democratic and solidary Europe!